The full-time regular Master of Business Administration is an opportunity to achieve the aforementioned challenges and reap the opportunities. 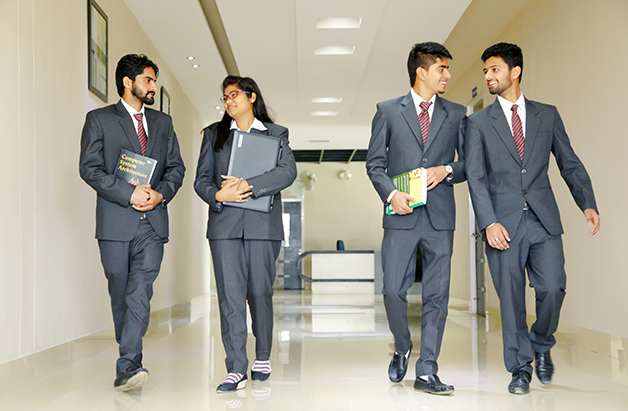 Here, a plethora of activities like international platforms for industry interaction, meetings with corporate honchos, CEO’s, top management of MNC’s etc., aggressive placements in the top corporate houses of India and abroad, renowned faculty & academia, world-class infrastructure, 100% online teaching pedagogy etc. are just some of the things that make our students culturally sensitive, dynamic and ethical global business leaders of tomorrow. The structure of the program is so planned that it equips the students to imbibe holistic education and requisite skills. The Department carries a vision of becoming an enabler for the future managers and entrepreneurs to touch the highest echelons in professional growth. We have multiple market-oriented specializations through which we can explore the genius of our students. In order to meet the needs of the ever changing corporate world the students are provided with well equipped library and Wi-Fi connectivity. Pedagogy used by well experienced and dynamic faculty members effectively caters to the needs of the students. The team is whole heartedly engaged in reducing the gap between class room knowledge delivery and skill requirements of the real business world. As our commitment towards the industry and society at large we are engaged in making the students industry ready by improving industry-academia interface through experiential learning programs like Industrial visits and effective summer internship program. Candidate should possess a 3-year Bachelor’s Degree in any discipline from a recognized university.